Cheshire West and Chester Libraries invite you to discover what your local library has to offer during Libraries Week from 8 to 13 October. Libraries Week is the annual showcase of the best that UK libraries have to offer, encouraging everyone to discover their local library. This will follow on from all the free fun that will also be on offer at the ‘Fun Palaces’ events in some libraries on Saturday 6 October. 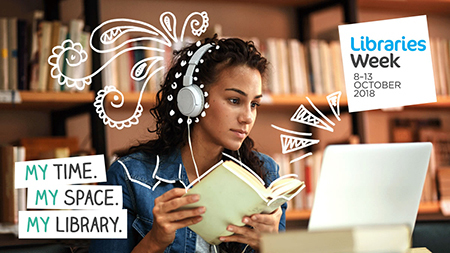 Between 8 and 13 October, libraries across the country will participate in Libraries Week. The focus this year is on wellbeing and how libraries can help combat loneliness and provide a space for reading, creativity and support. Throughout the week Cheshire West Libraries will be promoting all the fantastic activities that they regularly provide as well as special activities including a Tai Chi taster at Great Boughton Library, Tea and Tattle at Weaverham Library and the Book Doctor Service at Storyhouse. This is where participants can email ‘the Doctor’ with their mood and interests and ‘the Doctor’ will respond with a book recommendation. Libraries will be hosting coffee mornings where visitors can chat about their favourite reads or find out more about what their local library has to offer. In some libraries visitors can enter the Libraries Week Lucky Dip, choosing from a collection of hand wrapped books with intriguing clues alluding to the book inside. Perhaps you’ll discover a new favourite read. To finish off the week community choirs across the borough will be bringing the joy of singing to some libraries on Saturday 13 October. Councillor Louise Gittins, Cabinet Member for Communities and Wellbeing said: "We have a great programme of activities on offer at our libraries during Libraries Week to help people discover what is available in their local community. "Our Libraries have great facilities and activities on offer all year round. This is a great chance to experience what libraries can do for you. Everyone is welcome, it's completely free and we'll be delighted to welcome new faces during Libraries Week. Libraries Week will be celebrated in libraries throughout Cheshire West – contact your local library to find out more. Cheshire West and Chester Libraries also offer free digital services such as eBooks and eMagazines which can be accessed at home, so you can discover what the library has to offer any time of day or night. You can join the library online or at any library in the borough.